Tub and shower surrounds play an important role not only in the look of your bathroom, but in its function as well. Tile is a beautiful decorative element that also adds waterproofing and ease of maintenance to your newly remodeled bathroom. Practical need not be dull however, as our large selection of tiles and mosaics for shower or bathtub enclosures show. Designed to look gorgeous while working hard, they are the perfect combination of practicality and great design. Whether you’re looking for a shower enclosure, or a backsplash over your bathroom vanity, a beautiful bathroom tile design can transform a plain space into a standout sanctuary. 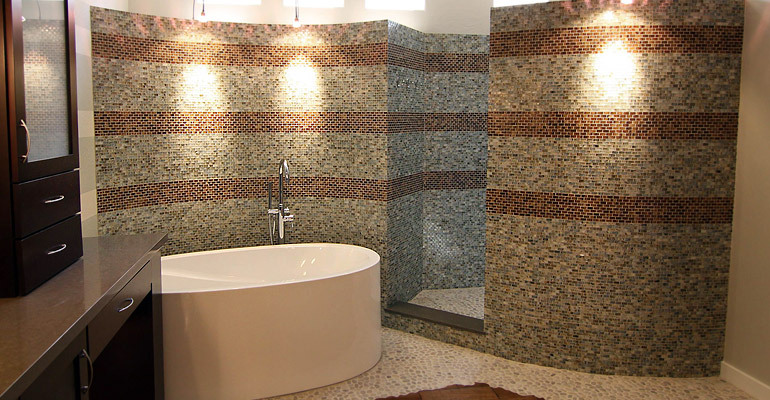 Discover ways to use tiles and mosaics available in different sizes, materials, patterns, and colors that you can try in your bathroom here at Flooring Creations with our friendly and knowledgeable staff of design consultants. In addition to the material you choose for your bathtub or shower surrounds, you’ll also need to choose the size of your tile. Large tiles are currently quite popular, creating a seamless, modern look in the bathroom that can also help this space feel larger and more inviting. Smaller tiles deliver a more traditional classical look for your tub or shower surround, but will have more grout lines. We recommend using smaller size tiles on shower floors as the increased grout lines will give the appropriate traction. As you consider bathroom remodeling ideas, it’s also worthwhile to remember that tiles are available in a variety of styles, including square, rectangular and mosaic. Mixing and matching the shape, style, and size of the tiles in your bathtub or shower surround is an excellent way to make this feature pop and turn your bathing area into a design feature that truly catches the eye. In regards to the color of tile, did you know that different colors can invoke different moods. So for example a cool color palette which would be whites, grays, espresso and blues. Would invoke a very calm tranquil spa like feeling which is very adequate for bathroom usage. Tile is also hygienic and easy to clean and maintain, which is perfect for bathrooms! With their ‘fresh’ appearance and ‘easy wipe’ surfaces, hygiene is yet another benefit when using tiles in the bathroom. You can also choose to include a handy niche, or multiple niches, in you shower or bath surround which offers convenient storage and a seamless, upscale look. This space carves out a place to keep soap and shampoo within easy reach. Do you have a bathtub and want a shower instead? Although soaking in the tub might be a nice way to unwind, modern life demands the speed of a shower. Whether you are planning to sell your house, or are simply ready for a beautiful new bath and shower, our knowledgeable and friendly design consultants will be here to help you achieve just that!